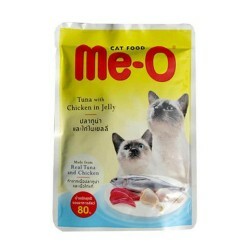 Product Information-Me-o Tuna with Chicken in Jelly made from Real Tuna and Chicken. Guidelines-The amount fed can be adjusted according to your cat breed, weight and activity level .It is recommended to serve Me-O cat Food Tuna with Chicken in jelly with original Me-O Dry Cat Food to meet your cats nutritional needs. For the cat that regularly enjoys Me-O Dry Cat Food we recommend topping up those nutritional kibbles with our super tasty Me-O Tuna with Chicken in Jelly for your cats maximum pleasure. Clean drinking water should be available for your cats at all times.